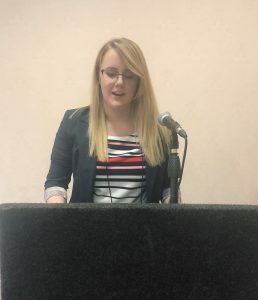 Rachel Lyn Atkins and Jenna Burke, both of the 5-Year English MA Program, have received awards at the 2018 Sigma Tau Delta International Convention. Rachel Lyn Atkins received 3rd Place in the category of Critical Essays in British Literature for her paper entitled, “The Satanic Verses: Forming the Immigrant Identity.” Her essay, written for her capstone on Black British Literature with Dr. Mindi McMann, was presented at a session entitled, “The Effects of Immigration and Colonialism in World Literature.” The recognition came with an award of $200. Jenna Burke’s work “Kindred: The Neo-Slave Novel & Black Female Bodies” also received an award at the convention. 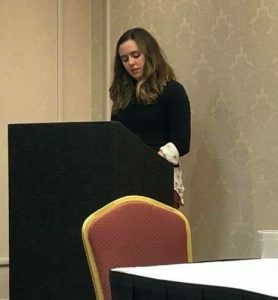 Her essay, presented for the session “Dystopian Bodies: Confronting Reality through Speculative Fiction”, was awarded 2nd place for the Justin Q. Owen Award recognizing critical essays that represent this year’s convention theme, ‘Seeking Freedom’. This recognition for her paper, an essay written last fall in a graduate course with Dr. Cassandra Jackson, also came with an award of $200.